This is the colour I was on about! You just don’t get that when it’s not autumn. You know, being a writer is a brilliant job for a heck of a lot of reasons, some more obvious than others. I was reminded of one of the less obvious ones the other day – and that is how friendly and helpful people can be. You see, part of the story I’d been planning to write is sort of set in an antiques shop. I’d read a few books on antiques but decided that I should really go and have a look at one. So I did. I hopped in to my car and I drove to a big one. And this is where I feel guilty. I walked in and was greeted by the very friendly owner, asking how she could help. I came clean and told her that I was only there to waste her time. I explained who I was and why I was there and told her I only wanted to be nosy. And you know what? She didn’t mind that I wasn’t there to buy anything. She happily gave up half an hour to help me, answering lots of my questions and doing pretty much all she could to help. She even gave me a copy of their trade paper (I gave her a signed copy of my book in return). So yes, being a writer a great for many reasons. One of them is definitely that it gives me the opportunity to meet people. Because, you know, most people are really nice. ADDED – Ooh, almost forgot to mention that the super new Writers’ and Artists’ Yearbook website is up and running. It looks excellent. 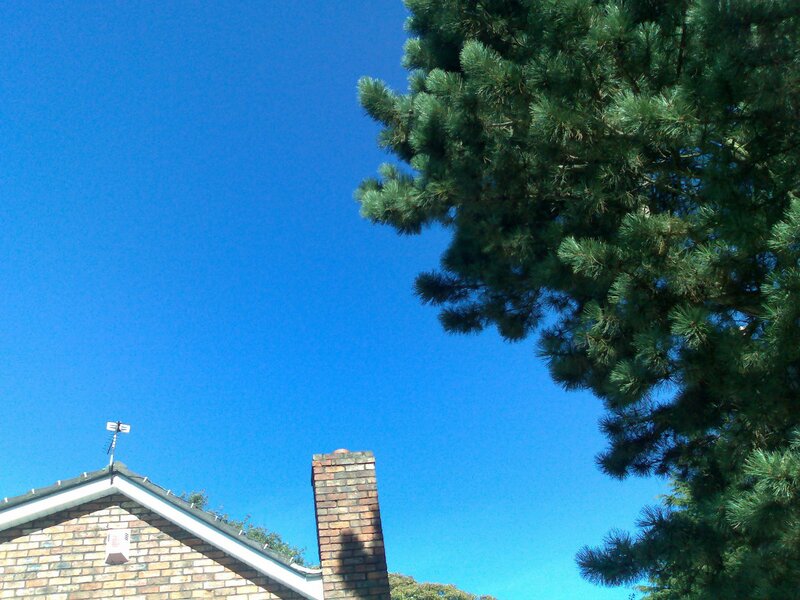 What a brilliant blue sky. Well done on charming the shop keeper. You may have a new fan there. Yup, that’s blue all right.I have just checked out the Writers’ & Artists’ Yearbook site – great – so thanks for nudging me into buying the 2008 edition.Have you entered your blog yet for the blog competition? Hello all! WG – well, I’m not sure ‘charmed’ is the word I’d use; I just asked a few questions and promised I wouldn’t touch anything!Lexi – the site is good, isn’t it? Hmm, not sure about the comp (confession: I’ve not actually looked at the details). Never say never though!MTW – Yay! A fellow autumn fan. It’s absolutely my fave time of year. And what a miserable council you must have. Depriving you (and all those kids!) of leaf kicking. Sheesh! A digrace.Thanks for stopping by folks.